As the European Green Capital in 2015, Bristol has had a lot to live up to in terms of its green credentials. Without doubt, it certainly does this and in 2016 Bristol was one of the greenest cities in the UK. At On the Dot, we’re proud of Bristol and we’re proud of our own environmental credentials as an eco-friendly removal company based here. As a removal company, we like to talk about how environmentally we can transport people from their former home to their new home. I got to thinking then that perhaps it’s time to turn our attentions to the homes themselves. So I’ve put together this little shortlist of some of Bristol’s incredible green housing projects and developments. I hope you enjoy reading it as much as I’ve enjoyed researching it. Winner of the South West Green Energy Award for ‘Best Housing Scheme’ in 2009, The Yard is a self-build development created through the Ashley Vale eco-self-build community. The development is nestled amongst the allotments of St Werburgh’s and the city farm and features 26 houses made from copper, wood and glass, complete with solar panels. The development also features a work and leisure facilities called Wildgoose Space, which features a community room and 3 work units. The area was developed after a local community group opposed a developer’s plans to build a housing estate in the area. The group won their case and quickly moved to buy up all the land in the area (2 acres in all). From there they formed a co-op to design their new homes. Each eco-house was designed individually and most feature Fermacell boards, which are more environmentally friendly than traditional plaster. The materials were sourced from sustainable suppliers and many of the residents make enough energy to sell it back to the grid. Based in Montpellier in central Bristol, the Courtyard is the first purpose built co-housing development in the city and quite possibly the first self-build development in the UK to pilot self-build with future residents. The development’s eco credentials are second to none as well and the homes on it have become the first in Bristol to receive an A-rating in both environmental impact and energy efficiency. It is certainly an achievement to see a self-organised and self-funded project achieve zero carbon without subsidy and a testament to the community power that Bristol is so known for. Hanham Hall is based in the east of Bristol, just off the ring road, and is England’s first large-scale development that is totally zero carbon. The development itself is a converted NHS hospital across a 6.6-acre site, featuring 185 1-5 bedroom homes. This can be broken down into 122 private properties (developed by Barratt), 7 shared ownership, 54 social rent (Sovereign Housing Association) and 2 open market rents. The development is run entirely by its residents who all hold shares in a community interest company which manages the grounds and buildings. A truly innovative series of homes is being built by in the Shirehampton area by the Bristol-based developers Connolly-Callaghan. These will be the first new affordable homes in the UK to be made from straw (yes you read that right). Well not entirely from straw. The homes will use Modcell’s prefabricated straw bale panel system. The developers believe the insulation will help cut the owner’s heating bills by as much as 90%. 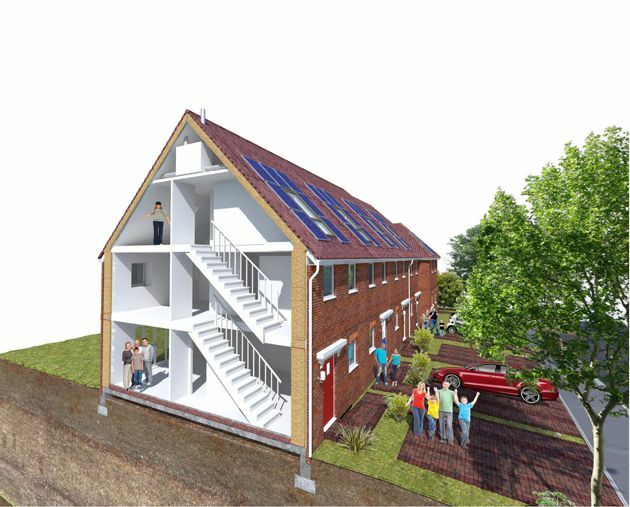 Prof Pete Walker from the University of Bath who was involved in the development of the project believes straw holds the key to Britain’s low carbon future in the housing sector. In the heart of Bedminster in the south of Bristol, you will find what many believe to be Bristol’s greenest housing project to date. The development, which features 17 houses and 9 apartments, will utilise European “Passivhaus” design principles. This is a European standard for energy efficiency that originates in Germany and takes a fabric first approach to low energy. The development is being developed by Bristol-based Urbis, who are also known for their redevelopment of Bedminster’s Robinson’s Buildings into 100 flats and is also leading the refurbishment of East Street’s shopping centre.